This is book number six in a “Junior Bender Mystery” series. I have not read any of the other books in the series and because of that I think I was a bit lost right from the start. Junior Bender is a bit of a detective – but not for the good guys. He’s a burglar who does a bit of detecting work for the criminal bosses in the area. At the start of the book, Bender is in the security office for a local mall. The mall, like so many around the country, isn’t doing too well. Most people tend to shop online. But this mall is having some significant ups and downs during the holiday season. Enough ‘ups’ that the mall has hired two Santas – one for either end of the mall. But on the down side, there appears to have been more petty theft than usual, even for the holiday time of year. The mall is owned by a Russian gangster, who calls Bender in to investigate. At the beginning, I didn’t realize that Bender was a criminal. We’re informed that the mall owner has contacted him to investigate the theft problems. Without knowing any more, I immediately assumed that Bender was a detective or retired cop. So when I later read about his burglary tools in the trunk of his car, I’m confused. More-so when we’re informed that the mall owner is a criminal. So who is Junior Bender? Of course if I’d read other books in the series I’d already know, but picking up this book new, I was confused. I only got to know more about him as the book went on. (Of course, if I’d read the Goodreads reviews before I read the book, I would know, but I prefer to read a book as fresh as possible so that I am not influenced by someone else’s thoughts. Bender’s dealings with the Jewish Santa, Schlomo, aren’t what one would expect of a criminal (compounding my confusion), but I liked the gentleness and the holiday message here. It grounded the characters in a nice and fresh way. Unfortunately, despite some holiday philosophy, we also have a murder, corruption, and a threat against Bender’s family. So much for the holiday spirit. What makes the book worth reading are the characters. Bender, Schlomo, and even the ‘heavies’ here are wonderful examples of literary characters that are unique and come across as quite real. What doesn’t work so well are the multiple stories taking place. A mystery, with a red-herring or two, would have been fine. But the thefts, the murder, the history of Schlomo, the … well, you get the idea. It was more than was necessary for a good mystery. Looking for a good book? 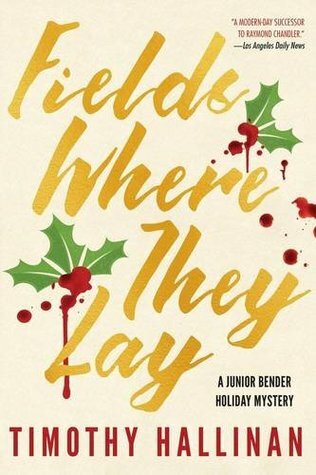 Fields Where They Lay by Timothy Hallinan is the sixth book in a series – which is moderately important to know and has some great characters, but tries to tell too many stories.